Wilkin 2, Walsh, Lomax, Makinson, Swift, Soliola, McCarthy-Scarsbrook, Roby. Jon Wilkin scored twice as St Helens thrashed Bradford Bulls, who stay above London Broncos at the bottom of Super League table on points difference. Saints led 22-0 at half-time, Luke Walsh converting four tries, the pick of which saw Matty Dawson run 80 metres and play in Wilkin to open the scoring. The rout continued as Tom Makinson, Adam Swift, Louie McCarthy-Scarsbrook, Sia Soliola and James Roby crossed. St Helens remain second, but the win cut Leeds' advantage to one point. The result ended Bradford's recent upturn that brought victories over Catalan Dragons, in the Challenge Cup, and that finally took them to zero points, wiping out the with which they began the season because of administration. 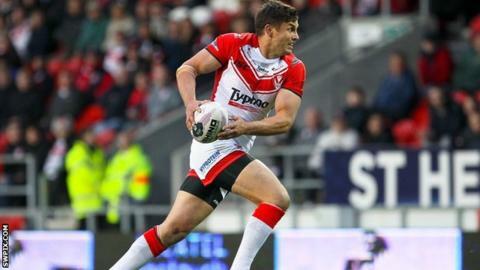 Saints winger Tom Makinson scored his 14th Super League try of 2014, three ahead of second top-scorers Ryan Hall and Morgan Escare. Those victories came after managing director Steve Ferres apologised for their "embarrassing" 84-6 defeat by Wigan Warriors, the biggest of several thrashings the Bulls have received this term. Under intermittent rainfall at Odsal, the hosts enjoyed a lively start. Ultimately though, Adam Henry's strong run that almost resulted in a try would prove to be their afternoon high-point. After 11 minutes, Wilkin broke the deadlock courtesy of the unselfish Dawson, triggering a Bradford collapse. Walsh ran in soon after before turning provider for Jonny Lomax and Wilkin, thanks to a clever cross-field kick and half-break respectively. The pattern continued in the second period as Saints cut through a beleaguered Bradford defence at will, with the only blemish on their afternoon's work being Walsh, who racked up 18 points, missing two conversions. "We had two players pull out after our final training session, but we started well. "Then we gave them too much cheap ball and you cannot afford to do that against a side like St Helens. "After that we went into free-fall a little." "I thought James Roby was superior to anyone else on the field. "We had about six kids on the field who have played only 10 or 20 Super League games so the guys should feel really happy. "Sia Soliola was outstanding too and he has a big effect on how our team performs. "We came here today after Bradford had two great wins and we had to work to get to where we did." Bradford Bulls: Kear; Wood, Henry, Arundel, Foster; Addy, Gaskell; Kaufusi, Diskin, Sidlow, Olbison, Purtell, Pitts. Replacements: Walker, O'Brien, George, Mellor. St Helens: Lomax; Makinson, Jones, Dawson, Swift; Hohaia, Walsh; Walker, Roby, Walmsley, Wilkin, Greenwood, McCarthy-Scarsbrook. Replacements: Masoe, Soliola, Wellens, Thompson.